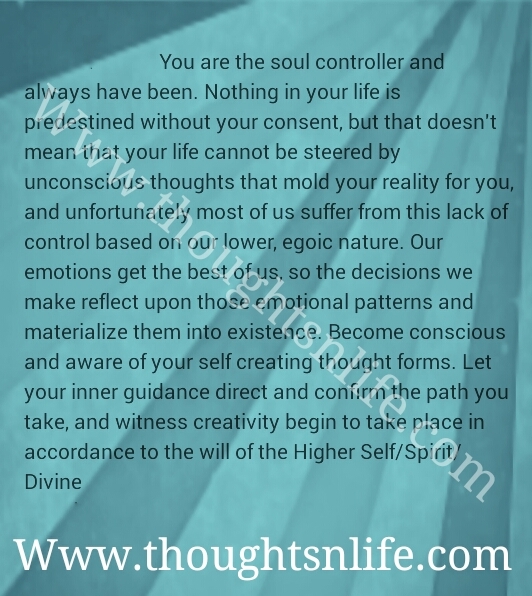 You are the soul controller and always have been nothing in your life is predestined without your consent , but that doesn't mean that your life cannot be steered by unconscious thoughts that molds your reality for you and uncomfortable most of us suffer from this lack of control based on our lower, egoic nature. Our emotions get the best of us. So the decisions we make reflect upon those emotional patterns and materialize them into existence . Become conscious and aware of your self creating thought forms. Let your inner guidance direct and confirm the path you take and witness creativity begin to take place in accordance to the will of the higher self/spirit /divine.